Buffalo wings are a relatively young dish as far as the food timeline is concerned.The creation of this famous wing recipe is sometimes attributed to a woman who supposedly made them in her restaurant in Buffalo, New York in the mid 1960s. The actual reason for the cooking procedure, sauce and method of serving is not exactly clear, but the cheap-to-make appetizers became an instant hit. The original recipe called for deep frying the divided wings and then baking on a sauce comprised of margarine and hot sauce. The ratio of hot sauce to margarine determined the 'heat' factor of this dish which was typically served with blue cheese dressing on the side along with celery sticks. To me, this sounds like a recipe concocted by someone who did no have much to work with and who also did not care about cholesterol! 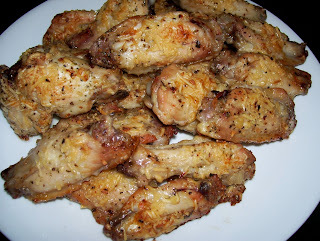 I am not a wing expert, but I have made Wings Italian for my family and friends and they ate them with gusto. This easy recipe is simply baked, needs no deep frying and is very tasty without the added calories and fat content of blue cheese dressing. 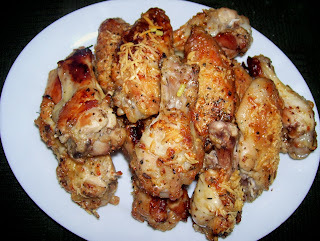 Wings Italian makes an irresistible dish for a buffet or potluck table. The recipe may be increased. (If desired, trim away some of the skin prior to marinating...pictured at end of the recipe). Marinate the wings in the dressing for 30 minutes. Drain, and place wings on greased baking sheet. Sprinkle the wings with oregano (to taste), the cheese and salt and pepper. Bake 375 degrees for 35-40 min. or until lightly browned and tender. Serves 3 or 4. Some of the skin was removed from the batch of wings above with no noticeable change in flavor.